Posted March 29, 2017, 6:05 p.m.
Posted Feb. 22, 2017, 6:10 p.m.
Jonah Min Hwang, an 8-year-old boy, was shot and killed Monday, Feb. 20, in the 1100 block of West 111th Street in Pomona, according to Los Angeles County coroner’s records. About 6:30 p.m., Jonah was in the living room of a home with other children and adults. The residents of the home had invited a family over to dinner, Pomona Police Lt. Eddie Vazquez said. A car pulled up outside and a person began shooting. Jonah was the only person who was struck by the gunfire, Vazquez said. Los Angeles County Fire Department personnel treated the boy before rushing him to a hospital, said supervising fire dispatcher Ed Pickett, who confirmed that the boy had been shot in the head. Police do not believe the residents have any gang connections, but this is the second time the house had been shot at in three weeks, Vazquez said. No one was injured in the previous shooting. "Nothing prepares us for when a child is seriously injured or killed," Vazquez said. A couple and their two children – a son and a daughter – live in the house that was fired upon, said David Armijo, who lives in the area. The couple holds Bible study at the house, and the kids often play outside and ride their bikes, he said. About 11 a.m. the day after the shooting, rain fell lightly over the small beige house, where colorful flowers line the frontyard. The street was quiet — the only sign of a homicide was the four bullet holes that had pierced the garage door and stucco walls. 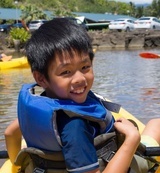 Jonah was adopted from an orphanage in Taiwan less than three years ago, according to his family. “He had an infectious smile and loved everyone and everything: sports, wrestling with his dad, running, laughing, superheroes. … Jonah was a light and joy in our household and we cannot imagine our family without him,” a statement from the family said. Sandi Hwang Adam, who said Jonah’s parents are her cousins, started a fundraising page to help cover costs of the boy’s funeral. She remembered first meeting Jonah and connecting with him, even though he did not yet know English. “He was a boy that was just full of joy. When I first met him, newly adopted from Taiwan, he really didn’t speak English, but his playful nature prevailed and he somehow convinced me to compete against him in a running race (he won),” Adam said in an email. Jonah’s uncle, Terry Yang, shared his memories of the boy on Facebook. “Rest in peace, Jonah,” Yang wrote. “God has you now, and we will forever have a hole in our hearts as a result." Pomona Mayor Tim Sandoval told KCBS-TV Channel 2 that the Hwang family volunteers in Pomona. Police spent Tuesday canvassing the neighborhood, and hope that surveillance cameras some neighbors have outside their homes will help identify suspects. I agree, something is definitely wrong here. It just doesn't make sense that if it's such a good family, this man, who has no previous criminal record, targets this house 3 times. It almost feels like the friends were invited over to be witnesses and not just to have dinner...I don't know....strange, very strange....I hope we get follow up on this story. — Criminal Justice Student May 11, 2017 at 1:14 p.m.
— cc@yahoo.com Feb. 28, 2017 at 2:39 p.m. If this is a good family and their is kids that live there..Why would anyone shoot at the house not once but twice?.Pomona hasn't been active like that recently like before..maybe someone wants them out that neighborhood? But look what happened now..this is a mess..Too much BS going on right now....I think we need to call the watchers cause people don't know how to act now..I thought we was pass this already.??.. — Tell me its not true Feb. 26, 2017 at 1:39 p.m.